New from Paragon....The Dog Hut Hot Dog Steamer and Merchandiser. Sturdy and durable hot dog steamer backed up by a 5 year warranty. Heavy Duty 20 gauge stainless steel construction throughout makes The Dog Hut™ the most durable hot dog steamer in its class. Proprietary heating system featuring heavy duty submersible stainless steel element & automatic shutoff feature when water gets below a certain level. Adjustable thermostat and holds up to 168 hot dogs(or sausages) and 42 buns. The low indicator light lets you know when more water is needed to heat your hot dogs Colorful and brilliant eye catching graphics featured on both sides of the hot dog steamer will allow front-counter or rear-counter merchandising. Great for rental shops, convenience stores, concession stands, vending carts, break rooms, snack bars, cafeterias, and many others. Made in the USA. Removable Insert (included); allowing for a combination of up to 96 hot dogs and 30 buns. Eight quart water reservoir for increased holding times is the largest in the business! Plus, the quick turn water release valve eliminates burned fingers and spilled water. The Classic Dog will continue heating after the water has evaporated and won't damage the element. 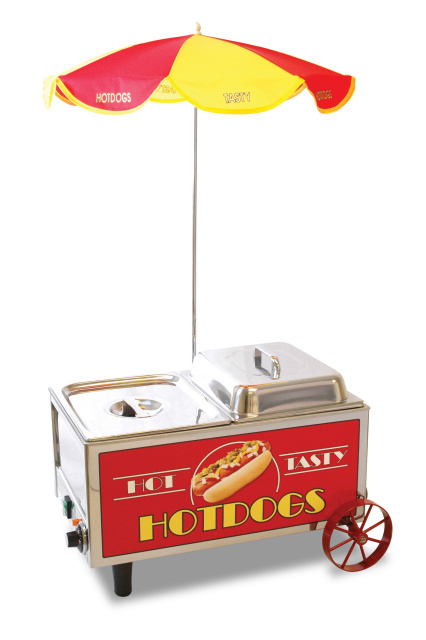 From Paragon International...Attractive and versatile Hot Dog Cart with umbrella. 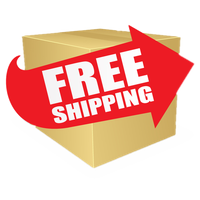 This sturdy cart is made of all steel construction and has a chip resistant coating. This hot dog cart comes with bright red and yellow umbrella with a blue base to draw a crowd and for vendor and food cover and protection. Breaks down easily to move it from one location to another. And break down is simple for storage. Commercial grade steel construction. Can hold hot steamers, grills, and hot dog rollers, along with condiment trays and dispensers. The Dogpound Hot Dog Steamer by Benchmark USA. Great commercial hot steamer that can hold up to 164 hot dogs and 36 buns. Great for coliseums, indoor arenas, football and baseball stadiums,convenient stores, racetracks, and other venues that do a high volume, and don't want to have your customers wait in line. Furthermore, no need to prepare hot dogs in advance, but now you can serve them fresh and tasty right out of the steamer! The unique divided hotdog tray allows for different sizes of dogs or sausages to be cooked and merchandised simultaneously. Stainless steel construction and removable product trays and doors insure ease of cleaning. Graphics on the front and back allow for either front-counter or rear-counter merchandising. Great item for fall football concession stands...grab one today. Hot Dog Starter Kit. A great item to have to compliment your new hot dog steamer or cooker. This starter kit includes one 9" stainless steel hot dog tong, one stainless steel tong holder, and 100 paper hot dog bags. Stainless Steel 9" Hot Dog Tongs. Great accessory for your hot dog business. Beside using these for handling hotdogs, these tongs can be used for turning foods in a frying pan, dipping pasta out of boiling water and hundreds of more uses in a foods service business. These tongs will not rust, are easy to clean easily and won't discolor - highly durable and dishwasher safe. 1000 Count Hot Dog Foil Bags. These Foil Hotdog Bags are ideal for packaging and holding cooked hotdogs. Pre-package your hotdogs in these bags and put in a warmer for fast serving. Each bag is 3-1/2” x 1-1/2” x 8-3/4” and will hold a standard length hotdog. Paper Hot Dog Bags. These hot dog bags are the economical way to serve hotdogs. The are easy to use and inexpensive. Packed 1000 bags per box. New at Standard Concession Supply....Benchmark USA Hot Dog Roller Grill for 20 Hot Dogs. High Quality Hot Dog Roller Grill made of Stainless Steel construction for easy cleaning and durability. 360 degree roller rotation insures evenly cooked hotdogs. All of these grills feature a high-torque motor and are covered by Benchmark USA’s exclusive three-year warranty. Great for break rooms, concession stands, fast food restaraunts, little league baseball, bingo snack bars, and more. Optional Sneeze Guard for 20 Hot Dog Roller Grill featured above. Great for self serve settings. Bunboxes for Hot Dog Roller Grill - 20 Count. Optional stainless steel dry bun box to keep your buns and dogs warm and fresh for your customers. Click on the link above to see a photo of the hot dog roller grill complete with roller, sneeze guard, and bun box. Need a larger hot dog roller than for 20 hot dogs, then this Benchmark USA 30 Hot Dog Roller is for you. This hot dog roller will serve larger crowds, and you will be able to store more in the optional hot dog bun box. This hotdog grill features a Stainless steel construction, removable drip trays and non-stick rollers that ensure ease of cleaning, as well as, a 360 degree roller rotation that insures evenly cooked hotdogs. And this grill feature a high-torque motor and is covered by Benchmark USA’s exclusive three-year warranty. Optional sneeze guards and dry bun boxes are available. Optional Sneeze Guard For 30 Hot Dog Grill. Sneeze Guards are many times required by local health departments. Helps keep dust and other contaminants away from cooking hot dogs. Paragon International Pro Series Ketchup/Mustard Condiment Dispenser. The Pro Series server pump unit has a stainless steel body and uses a heavy duty plastic pump that dispenses one ounce with each pump. Sturdy enough to be used in a restaurant or be used on the road at the next festival. Included you will find one red sticker and one yellow sticker to designate your dispenser as either ketchup or mustard. Complete your hot dog and concession Stand areas with this Condiment Station Set-up. This station features two color coded pumps and a 3 well condiment station for a variety of toppings. Benchmark USA's Condiment Station is constructed of heavy duty stainless steel for years of service and is guaranteed by Benchmark's exclusive three-year warranty. It features two pump wells that will accept #10 cans, 1.5 gallon containers or 3-quart stainless steel jars. The color-coded pumps dispense a maximum of one ounce per stroke. Mini Hot Dog Cart Steamer. New from Benchmark USA. Holds 60 standard size hotdogs and 30 buns. This Hotdog Mini Cart is sure to draw attention and sales with its attractive styling reminiscent of the many vendors on the streets of America. It is built out of mirror-finished stainless steel and carries Benchmark USA’s three-year warranty. It comes complete with the decorative wheels, umbrella, eye-catching graphics and separate hotdog and bun wells. Great for Buffets, Concession Stands, and Cafeterias. Nostalgia Electrics Old Fashioned Hot Dog Cart & Umbrella Model HDC-701. This commercially-rated Hot Dog Cart Unit & Umbrella is a durable, enameled steel hot dog cart with hot dog roller to cook hot dogs plus 2 large hot dog and bun warming/steaming inserts. It features 3 condiment inserts for chili, sauerkraut, nacho cheese, and more! Beverage cooler to keep drinks ice cold and service shelf to hold paper goods, ketchup, relish, and mustard. Comes with umbrella and PVC "sneeze-guard" cover for protection of foods. Holds 12 hotdogs. Normally commercial units similar to these run into the thousands of dollars. An economically great way to start your profitable business today! Also a great item for Churches, VFW's, Fraternities, Lodges, Little League Baseball, and Flea Markets! And the hot dog cart and umbrella can be used for home use a well for those backyard and block parties barbecues. This hot dog stand is a fun way for guests to select and make their own hot dogs and hamburgers at a home picnic or party. Another avenue where fun and profit meet at Standard Concession Supply! Great starter Hot Dog Cart for this Fall Concesion Season! The newest and most innovative design in Hot Dog Makers has just been introduced by Benchmark USA....The Doghouse. It does not take alot of space, but can cook alot of hot dogs in a short time. Great item for convenience stores, school snack bars, different venue concession stands, skating rinks, little league baseball, cafeterias, break rooms, and more. This steamer not only cooks hotdogs, it merchandises and dispenses them in less than 15” of counter space. Ideal for self-serve and fast-paced environments, the Doghouse’s attractive visual graphics will promote impulse sales. The innovative dispensing mechanism creates a “No-Touch” sale. The Doghouse minimizes product waste and is extremely easy to use and clean. The Doghouse can accommodate hotdogs ranging from 1.2 ounces to 4 ounces.